The UIS Department of Athletics was excited to announce the comprehensive brand standard, which will promote the history and pride of the Prairie Stars. Six months after the decision for UIS to keep the Prairie Stars nickname, the University of Illinois Springfield Department of Athletics debuted its new look. On Friday, in the home of Prairie Star Athletics – UIS unveiled its new brand identity and gave those in attendance water bottles, buttons, t-shirts and more. "I am excited to launch the new UIS Athletic look as this is an important aspect of our marketing strategy in support of developing a strong brand identity," said Director of Athletics Kim Pate. "The new identity system provides a comprehensive brand standard that will allow for greater consistency and more creative opportunities. It is my hope that our students, alumni, the campus and community will have a greater sense of affinity and pride with the Prairie Star Athletics name." Studio Simon, based in Louisville, Ky., designed the logo with the input of a focus group. The initial four concepts were narrowed down to one in early March. Studio Simon then continued to tweak and add marks to get the athletics department a full brand identity – something it has not had before. The new logos include 11 main marks that are a combination of navy, Vegas gold and white, while also providing clean-looking one-color marks. There are also sport-specific logos and word marks to keep continuity throughout our facilities and marketing materials. 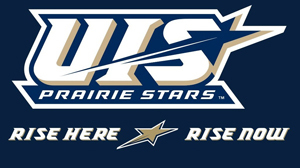 UIS also has two stars to use as a symbol of the Prairie Stars nickname in addition to a standalone Prairie Stars word mark. "It is a very exciting time in UIS athletics as we honor the rich history of the Prairie Stars, but reestablish who we aspire to be - a model Division II program," said Assistant Athletic Director for Media and Communications Amanda Murphy. "It is imperative in collegiate athletics to have a set of marks that set you apart from the competition and make your student-athletes, campus and community proud to be part of your institution." A new athletics tagline, Rise Here – Rise Now, was also announced to provide a focused message that celebrates the student-athlete experience at UIS. The message resonates with a growing and developing athletic program and the upwards trajectory that the athletic department is moving while providing tremendous personal development opportunities for Prairie Star student-athletes to acquire leadership and other essential life skills to prepare them for life after college. See the UIS Athletics Style Guide.